What Is Your Favorite Mascot? Why do sports teams have mascots? What are some of the most famous mascots? If you've ever been to a high school, college, or professional sporting event, you've probably seen a mascot or two. If not in person, you've most likely seen them on television broadcasts of sporting events and commercials. Mascots are those larger-than-life people, animals, or objects that schools, teams, and organizations adopt as symbolic figures. Mascots encourage crowds to cheer for their cause and often engage in all sorts of entertaining behavior. Many people think mascots bring good luck. In fact, the word “mascot" is a French word that has been used for hundreds of years to describe something that brings luck to a household. In addition to appearances at sporting events or large gatherings, mascots may also make public appearances to support a variety of causes. As goodwill ambassadors, mascots can donate time at community events to show an organization's support of local causes. Mascots can be adopted by any group seeking a common public identity. In addition to sports teams and schools, these groups can include military units and even consumer products. Sports mascots are by far the most popular, though. Mascots often reflect team nicknames. 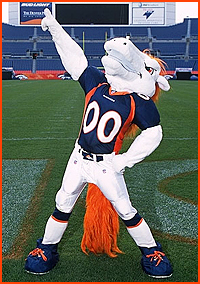 For example, the National Football League's Denver Broncos are represented by Miles, a white bronco horse. However, mascots do not necessarily have anything to do with a team's nickname. For example, the National Basketball Association's Houston Rockets are not represented by a rocket. 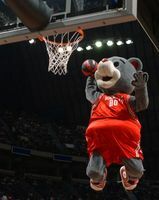 Instead, Clutch the Bear brings Rockets fans to their feet during games. Some mascots are chosen for the qualities they possess. Sports teams seeking a competitive edge, for example, might choose a predatory animal, such as a buffalo or a tiger, to represent them. Other organizations might choose a person, an inanimate object, or a costumed character to represent other qualities they want to be associated with. Other organizations might create a mascot that's completely unique and pure fantasy. For example, Major League Baseball's Philadelphia Phillies created the Phillie Phanatic as their mascot. From taunting referees to shooting hot dogs into the stands, the Phillie Phanatic has become one of the most popular mascots in the United States. Even if young Phillies fans don't remember the score of their first game, they'll probably remember the Phillie Phanatic's on-field antics. Depending on the game, a mascot's entertainment value can be just as valuable as the team's performance. Not all schools and sports teams have a mascot, though. Take Indiana University, for example. The Hoosiers, as they're known, do not have an official school mascot. 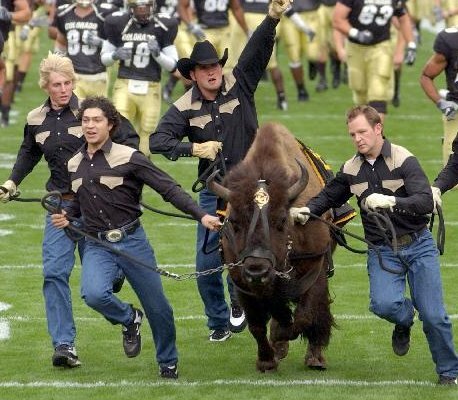 Although various sports teams at the school have tried a mascot from time to time (the football team tried a bison a while back), nothing has stuck. Perhaps this is because no one knows for sure what a “hoosier" is! There are many theories out there about where the nickname came from, but no one really knows the true story. At least one plausible explanation is that it came from a mispronunciation of a Polish word — “huzar" or “husar" — which referred to light cavalry fighters like the ones who fought with George Washington during the Revolutionary War. So maybe the “Hoosiers" should adopt a mascot that has the fighting spirit of the cavalry. What do you think? We hope you have sharp eyes! Tomorrow’s Wonder of the Day will soon be right before your eyes, but you still might not see it. What are some of the most famous mascots of all time? Head on over to the online Mascot Hall of Fame to see which mascots have made it to the big time! Why do you think The Famous Chicken, Mr. Met, and Slider are so popular? Does your school or favorite sports team have a mascot? If you're up for a challenge, design a mascot for your school, a sports team, your family, or even a favorite product. Draw or paint a picture of your mascot creation. Share your design with a friend or family member. I like this because I love mascots and they are really funny, also my favorite mascot is the nitany lion Penn Stats mascot. Thanks for sharing, Alexander! We're glad you liked this Wonder!! My favorite mascot is the scarlet nights of RUTGERS!!!!!!!!! Awesome! Thanks for being our Wonder Friend, Cjdaunb! Thanks for sharing, Supercoop! Glad you are WONDERing with us! My favorite mascot is the blizzard from DQ on the basketball game. Too bad they don't make real Blizzards that big, right Jason? Thanks for sharing your connection! Thank you for sharing, Jonas! We're really glad to hear from you! My favorite mascot is Muddy From The Toledo Mud-hens. He visited my school and it was cool. I live in Wisconsin so it would have to be the Packers and the Badgers! The denver broncos are my favret NFL team!!!!!!!!!!!!!!!!!!!!!!!!! I think that Scooby Doo is the best mascot because he entertains pretty much everyone. Probably because he's a dog and people see dogs as a mans best friend. I also think the Hoosier school should get a fighter mascot too! I love the Denver Broncos but they didn't do so well in the Super Bowl last season. I went to the Broncos field in Denver in the Winter a got a tour of the stadium including the locker rooms! We saw their mascot and got to take a picture in front of it. Nice, Wonderopolis. My favorite mascot is Blue for the colts. My favorite mascot is the cheetah and maybe Scooby Doo. That was an awesome game. My favorite mascot was v dogs. That is always my user name on games. The blizzard was my 2nd favorite one because he could like hardly see!! WONDERful! Thanks for WONDERing with us, Vince! Hey wonderopolis I really liked the video I love basketball and those mascots were not the best but I enjoyed the cool mascot costumes and hope to see more videos like this. The best mascot? Has to be Herke The Hawk from Iowa University. Peter puck all the way. Dear wonderopolis ok my favorite mascot is Brutus the Buckeye because he can do flips and he prays to the players and he's for Ohio State Buckeyes and they are the best team ever. I think they will win the championship. My favorite mascot is the Brutus the Buckeye. Because he can do back flips and my favorite team is Ohio State. I think it would be good to see a Wonderopolis mascot. If you decide to make one, please let me know because I LOVE WONDEROPOLIS! Hi Wonderopolis, I loved the mascot basketball game in the video!! After reading the article, I learned two new words 1: inanimate 2: ambassador. Did you know Indiana University's mascot used to be a bison! Also the word "mascot" is a french word! What is your favorite mascot? Mine is the pink panther in the video. Thank you for listening, Wonderopolis. (Responding to fshd) Maybe it could be a little kid named "Willy the Wonderopolis kid!!" We like that idea, Rhino Fan! Thanks for visiting Wonderopolis and sharing what you think a WONDER mascot might look like! I like the Ram's mascot. Will you make a Wonderopolis one? Thanks so much for visiting Wonderopolis and for sharing your favorite mascot with us, Josh! My favorite mascot is probably Brutus Buckeye. What's yours? P.S Go Buckeyes! Mrs. Guerin (the Beach) The clue right before your eyes made you think about glasses. Guess we were all wrong-better luck next time. Hey Wonderopolis, my mother's favorite mascot is the Rutgers Knight from the college she went to. My father's favorite mascot is Mr. Met from the NY Mets baseball team. My brother's is lighthouse Pete. My favorite mascot is the Knight from my dad's school. What is your favorite Mascot? Maddy M.
First and foremost- I have to say Go Pirates!! In Pike County, GA, we LOVE our mascot and have HUGE school pride. Our mascot unifies our school district. Wonderopolis, once again you have inspired me and my ideas to share with my students! Thanks for making your site a wonderful addition to my day! P.S. A mascot for Wonderopolis??? hmmm big possibilities. Hey Mrs. Caplin's Class, I like your thinking and prediction about tomorrow's Wonder. Personally, I am leaning toward a question about glasses. Can you tell me why I am thinking along this way? BTW- BRUTUS ROCKS!! Obviously the BEST mascot is BRUTUS the BUCKEYE since we live outside Columbus, OH. We think tomorrow's Wonder might be about your nose, germs or microscopic organisms. We're very proud of stretching our vocabulary today!! Good Morning Wonderopolis! I am very proud of my class for being able to use context clues to predict today's wonder. GO BEACH! As always, thank you Wonderopolis for a WONDERful lesson. Larger-than-life people, animals, or objects that schools, teams, and organizations adopt as symbolic figures are known as what? What is the name of the Philadelphia Phillies mascot? Mascots can be adopted by any group seeking a common public what?